Are you considering a career in the field of nursing informatics? If you would like to work within the large discipline of nursing, it is important to choose a specialty that is both fulfilling to you and high in demand. With so many different options to choose from, selecting the best subfield within the large discipline of nursing can be a daunting task. One option that is growing in popularity is centered around nursing informatics. What Do Nursing Informatics Specialists Do? 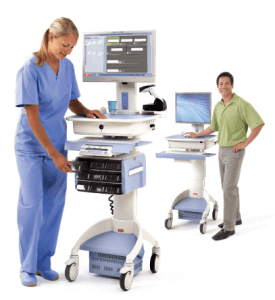 According to the American Medical Informatics Association, nursing infomatics is defined as a science which integrates nursing and a practice involving the management of communications technologies and information. Nursing informatics is all about delivering patient centered care. Nursing informatics is more than just a nursing specialty, it is also seen as a specialty within the field of computer science. As a hybrid field that integrates nursing, information technology and computer science, individuals who are torn between entering the field of IT or the field of nursing may have a great alternative. consumers and patients to nurses and physicians, an informatics specialist makes decisions that matters to everyone in every setting. Some specialists will work directly with information structures, and others will work with IT and processes. In every aspect of a specialist’s career, the focus will be centered around finding ways to improve a facility’s information management processes and communications throughout all levels of professionals, while still keeping the costs to provide patient care low. Specialists may work to improve computer technologies or research the efficiency of a new handheld device in the field. While patient care is a priority, most of these professionals in nursing do not work directly with patients. What Are the Working Conditions Like? When you are working towards entering a field like nursing informatics, it is important that you understand what the work conditions will be like before you begin studying. In this field, you can work in many different healthcare settings including: hospitals, clinics, health offices, universities, consulting firms and even corporations who develop or sell medical health information systems. It is not common at all for an informatics specialist to work with patients directly or perform any patient care duties. Instead, you will work behind the scenes with nursing professionals to test systems and provide training to people who will use these systems in a hands-on way. Technology is very important in today’s modern healthcare system, and there is a greater need for professionals who can test systems and improve communications processes. The demand for informaticists is on the rise, and with more and more hospitals adopting electronic systems, this demand is only expected to grow more. To be a informaticist, expect to be a clinical and technical professional who can keep up with every-changing technologies. If you are interested in being responsible for innovation in nursing IT, nursing informatics will give you the leverage you need to have a voice.